"and then fiery red sun." The works of Clemens Gadenstätter are a wonderful example to evidence how an analytical approach to the phenomenon of hearing may result in music that sincerely moves its listeners. This production, entitled “Portrait,” represents a kind of screen capture of Gadenstätter’s oeuvre. Portraits are sometimes given away as presents in order to convey something of the essence of whom or which they portray. 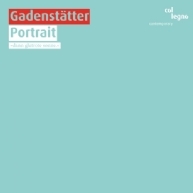 Clemens Gadenstätter’s music is perfectly suited as such a gift. All music composed by Clemens Gadenstätter. Lyrics on ballade 1 (10–13) by Lisa Spalt. Concentrated chamber music: Gerald Eckert captures the world of sounds in its manifold forms and shapes with meticulous care and maximum individuality.